KEY IDEA: Marriage is not about me or you. Neither is it about my needs or my spouse's needs. It is about how a couple is together in all things, working to build their marriage for the glory of God. This is done out of the truth of two persons becoming one flesh. "You never listen!" screamed the woman. "You don't understand me!" the man reacted. The married couple stormed out of the restaurant. A dinner that began nicely had ended abruptly and angrily. Both had their points of view. Both persons made their cases. Both persons thought they were correct. As the couple leaves the restaurant, I cannot help but wonder how on earth are they going to resolve their dispute, if ever that is going to happen? In a relationship, must it always be a case where one person is right and the other is wrong? When communications break down, where do they go to? Thinking from the perspective of the woman, she will be craving a listening ear and at the same time fuming why she cannot find that her husband can listen better. In a spate of anger, she has summed up her frustrations about the relationship in three words: "You never listen." Is it really true that anyone "never" listens? Probably not. The woman's words mainly reveal the gradual deterioration of the marriage. Maybe she is right. The man she loves has taken her for granted. She calls up her girlfriend to chat. After all, whenever she has marital problems, she knows there is a friend she can confide in. Tom wonders why his wife had not taken the time to show him the respect that he deserves. After all, he works hard for the family, and brings in the money to pay the monthly expenses. He even gives her a monthly allowance. After all these efforts, the least she can do is to give him the benefit of the doubt. Perhaps, she has taken him for granted. This time, things have gone a little to far. He feels disrespected, misunderstood, and lonely. Thinking that he has no one else to turn to in his frustration, he picks up his cell phone, ready to dial the number of the one who has been giving him tender loving attention: His personal assistant, Phoebe. For if Rebecca is not willing to listen and to give him attention, Tom can easily find another person who will. Who is right or who is wrong? Maybe, both are wrong. That is my position too. For whenever there is a communications breakdown, both parties are at fault. Even a 10% fault makes one at fault. The arguments may have been correct from the respective persons, but both need to be responsible for the communications process. Just like finding the right cable to connect the electrical device to the power source. If the connector is wrong, or if the connections do not fit, there will be no power for the device. Just like square pegs in round holes, without the proper cables, all of our electronic or electrical devices are practically useless, especially when the battery runs out. When the communications break down, unless both parties make amends, the breakdown remains. One of the common problems in a marriage relationship is the binary mindset whenever there is a dispute. Take the couple for example. When there is a problem, our human nature makes us take the stand that “I am Right and You are Wrong.” Imagine if both parties assert their rights, and refuse to admit that they are wrong. It can lead to an impasse where both sides will not budge. Each feels that they have given in a lot already. Why then should they give in any further? A binary mindset sees life in black and white. If you are not white, you must be black. If you don’t support my decision, you are against me. There is very little room to see that the world has not just whites or blacks, there are also Asians, Hispanics, Middle-Easterns, Eurasians, East Europeans, and so on. Likewise, there are many different reasons for supporting or not supporting any decisions. Maybe more information is needed. Perhaps, abstention is best in the light of doubt on both positions. Maybe, the decision needs to be delayed. A binary mindset turns a colourful world very much into black and white. There is not much maturity in understanding the world of relationships. An immature relationship will coat life only with brushes of black and white paint. Here are some examples of a binary mindset. If you don’t buy this toy for me, it means you don’t love me. If you don’t like eating hamburgers, it means you hate fast food. If you don’t say you love me, that means you don’t love me! If you don't see my point of view, you are not interested in what I think. Our love for our spouses is not a matter of buying stuff or not buying stuff. Neither is it about saying things according to the whims and fancies of the other person. We can remain faithful and loving even when we do not bow down to the personal preferences of our spouses. A black-and-white mindset will refuse to entertain a third point of view. It discards alternatives. For such a mindset, the only acceptable thinking is the I-am-Right-You-are-Wrong mentality. The question is: Why must it always be one person is right and the other wrong? What if both persons think that both of them are right? They are then free to be entrenched in their positions, thinking that it is ok to agree to disagree. Perhaps, Tom and Rebecca are both right in their opinions. Perhaps they have already made their own conclusions. Blame it on the circumstances. Blame it on the restaurant ambiance. Blame it on the dog or the colour of the carpet! As long as their own views are preserved, they are willing to accept that all are correct, only different. While it can relieve the tension, I think it does not go far enough in bringing a sense of two persons becoming one in marriage. Without an agreed set of standards, each will set his or her own standards. Tom feels he is a good husband because he brings in the income. Rebecca believes that she is a good wife because she keeps the house clean. Without any desire to understand the other person, each stands their ground, insisting that they have done their best in their marriage. Two problems arise out of this attitude The first is, when pride is involved, it is easy to insist both are right, even when both are equally wrong. The second is this: There is no oneness. In Genesis, we read of how the first marriage relationship is formed. What makes any marriage unique is the union. This union is not just a physical union, but a holistic union. God creates man and woman. God blesses the marriage of one man and one woman. Both are united in the flesh, of two becoming one. That is the direction and purpose of marriage. That brings glory to God. In that marriage, both are free to share of their deepest thoughts and feelings without shame, without fear, and without embarrassment. The man can feel free to share of himself without fear of negative repercussions. The wife can talk about her feelings totally trusting that the husband will honour her and protect her. When both are one flesh, both will know that whatever things they share or feedback to each other heal, help, or hurt BOTH OF THEM. That is what is meant by united in the flesh. In marriage, one is united physically, mentally, and spiritually. As long as we insist in our own way, any tiff, dispute, or argument, will spiral dangerously away toward a breakup, and quite possibly a divorce. When there is no oneness, there will be a broken marriage. A lot of research has gone into studying the reasons behind rising number of divorces in contemporary times. More than 100 years ago, only 10% of marriages ended in divorce. Now, it hovers around 50% at least! Marriage counselors Jack and Judith Balswick place a finger on “expectations” observing that fewer expectations lead to fewer divorces. As more men and women, husbands and wives become more highly educated, having more experiences and technical knowledge in worldly matters, they unwittingly apply the same set of expectations on their marital relationships. Spouses who have spent the whole day trying to meet customer demands and expectations return back to the home, hoping to be recharged and renewed by having their own spouse meet their demands and expectations. By bringing in work expectations home, they squeeze their marriage into the office mold, thinking that their spouses are the means to their own ends. That is the wrong way to see marriage. For marriage is plural, not singular people. Marriage is about two becoming one, not two becoming two persons or two opinions. Perhaps, whenever there is a conflict or dispute, the better approach lies in recognizing both persons are wrong in some way. Do not behave like a perfect person being right all the time. A marriage is two persons trying to do the right thing TOGETHER. It is about coming back to a fresh union every day. In a dispute, press the marital RESET button through three practical forms of I-Love-You. The first is: “I Am Sorry.” Whether we have the right thinking or idea is not important. The important thing is that the communications for some reason have failed. If Tom never listens, maybe Rebecca has chosen the wrong time to share of herself. Maybe, Rebecca needs to apologize for not recognizing the needs of her husband. Likewise, Tom can apologize for having a bad day and for being in a foul mood. Admit that they are wrong. These three words defuse lots of tension. It reminds us that everytime we point a finger at another person, several fingers are pointing back at us! 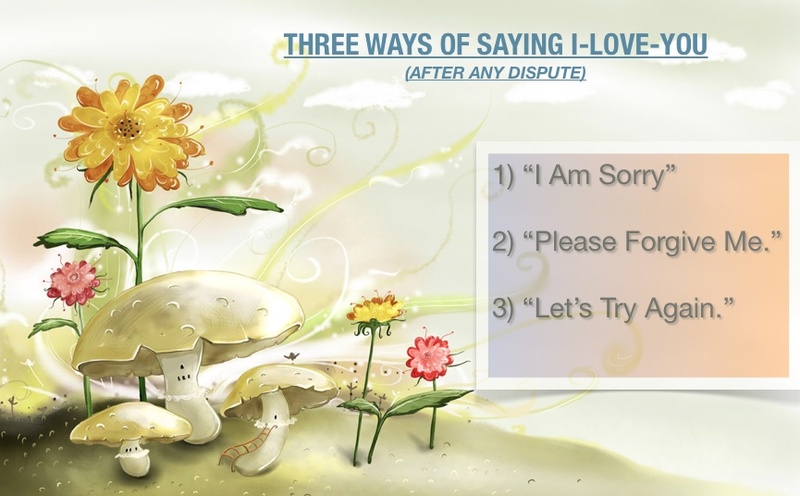 The second is: “Please Forgive Me.” Admitting one is wrong does not go far enough. One needs to seek genuine forgiveness. Give the spouse the benefit of the doubt. Allow one to sober up and seek the forgiveness of the other in humility and in recognition that we ourselves may not have been the best part of ourselves that day. Admitting we are wrong must be supported by a desire to seek forgiveness. This is what oneness is all about. Refusing to be one with our spouses means we are just happy saying we are sorry. For saying sorry without a seeking of forgiveness from the other is not union at all. Finally, in working through any arguments, disputes, or marital conflicts, there is a third and most important step: “Let’s Try Again.” Note that the first two phrases have more to do with the individual. The first is about admitting one is wrong. The second is to ask the other to forgive one person. It is the third that prepares the marriage to grow again. The third one is no longer about “I” or “me.” It is about US. Trying again together as a couple stems from the unique recognition that both persons have a common interest to make the marriage work. Without this third step, any reconciliation is not complete. When all things fail, try and try again. What does it mean to be one flesh? Let me close with the following thoughts by Jack and Judith Balswick about "differentiated unity" on how two individuals can become one over and over again. "We have a separate identity in Christ. We have high regard for self, spouse, and the relationship. We seek God-validation as opposed to self- or spousal-validation. We express ourselves as honestly and directly. We earnestly listen to and take each other seriously. Copyright by SabbathWalk. This devotional is sent to you free of charge. If you feel blessed or ministered to by SabbathWalk weekly devotionals, feel free to forward to friends, or to invite them to subscribe online at http://blog.sabbathwalk.org . You can also send me an email at cyap@sabbathwalk.org for comments or inquiries. Note that views expressed are personal opinions of the author and do not necessarily represent the views of any organization.